Welcome to the Daisy mp3 project page! 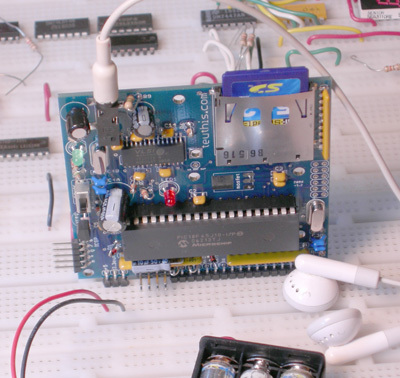 Here you will find everything you need to make the Daisy mp3 player. All the source files, hex files, EAGLE cad files, and documents are here. This is the official Make: mp3 player available here or at the Make: store. The Daisy is a multipurpose sound player for embedded applications. It can be used as a standalone personal music player,as the sound for an art project, in a kiosk, as a museum tour guide, in a toy, or anywhere that high quality embedded audio is desired. It uses MMC or SD flash memory cards so storage size is unlimited. It has several interface modes for either human or machine control. The Daisy is based on the Microchip PIC18F45j10, which is a new family of PIC microcontrollers. They are capable of running at a full 40MHz at 3.3 volts, which makes them ideal for this application. Also, most of the pins are 5 volt tolerant, easing interface with other microcontrollers. The other chip on board is a VS1011 from VLSI, Finland. It is an .mp3 and .wav decoder chip, a DAC, and a headphone amplifier all in one 28 pin package. I’ve been fooling around with this family of decoders since 2001 and I have never found an mp3 file it couldn’t decode... and the sound is very good! All of the firmware was written using CCS PCH C compiler. The CAD files were made with EAGLE cad. The manual was written with OpenOffice. 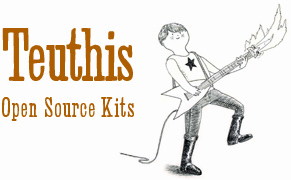 This is an open source project, with minimal protections reserved via a Creative Commons license. You are allowed to use any of the information on this page for any purpose, I only require attribution. Please go to the Creative Commons website and look at the GNU General Public License for the general idea. Viva la Revolution! Please Email me if you have any specific questions, or just to let me know you are doing this project! Please save these to disk, so that my server doesn’t get overloaded by serving up the files over and over again. Thanks! Use Cadsoft EAGLE to read the below files. It runs on Linux, Mac and PC, and it's free!